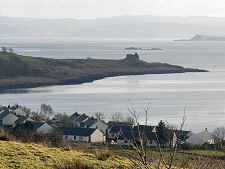 Kiel Church stands on the hillside above Lochaline, looking out over both the Sound of Mull and Loch Aline. This is a superb and striking location: and one which would have been still more prominent when most people in western Scotland travelled by sea rather than by road. Which goes some way to help explain why St Columba founded a monastery here in the 500s. The original church was called Cille Choluimchille which roughly (and oddly) translates as "The Church of St Columba of the Church". Kiel Church is an attractive building. When originally built in 1898 it was left with its natural stone on view. It has since been harled in white, leaving just the red stone trimmings to add more visual interest. But although attractive, the Victorian church is actually the least interesting of a number of different elements on view in the churchyard. The most important of these is the Old Session House, which lies immediately to the east of the church. This was built as a schoolhouse in 1780 and has since served a variety of functions. 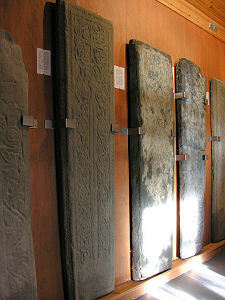 Since 1995 it has acted as a museum displaying and protecting an amazing collection of early grave slabs. 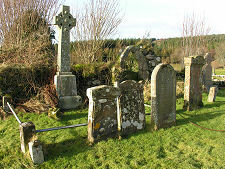 These were located in the graveyard until 1914, when they were moved into the church to save them from further weathering. 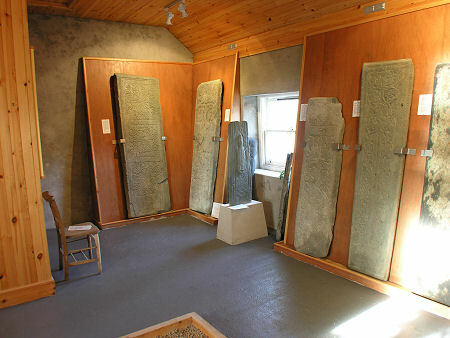 Most of the grave slabs on show in the Old Session House date from the 1300s, 1400, or 1500s, though two of the simpler stones are thought to have served as boundary crosses and date back to the 700s. The sheer amount of effort and artistry that has gone into carving these stones is breathtaking. This is all the more so when you realise that, unlike the Pictish stones they immediately remind you of, these were intended to be memorials to individuals: albeit the richest and most powerful individuals drawn from a wide surrounding area during a period in which the Lords of the Isles ruled what was almost an independent kingdom. The designs on the stones range from the relatively crude to the amazingly complex. Two of the vertical slabs and one of those on the floor carry carvings of huge two-handed swords, usually used to mark the burials of important chiefs or warriors. 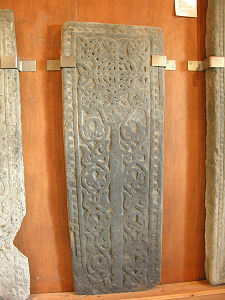 It is thought that the carvings of individual swords may have used the dead warrior's own sword as a template. Certainly they are carved in considerable detail, with one showing a "fuller", a groove that ran down the centre of the blade to make it lighter and easier to wield. 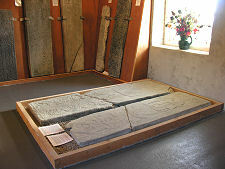 The two stones laid on the floor each carry pictures of the traditional West Highland ship or galley, the birlinn. These are the largest stones on show and also carry a range of other carvings, including depictions of hunting and warfare, plus inscriptions. Interestingly, although both of these stones have elements in common, there is over a hundred years between them, with the one on the left (as you look at them) dating to the end of the 1300s and the one on the right to the start of the 1500s. 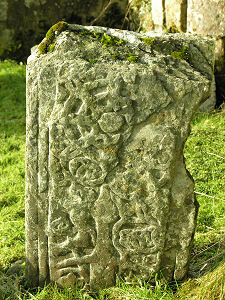 Two of the other stones on show have been "recycled", with their original fine carvings overlaid with fairly crude initials and dates. Standing beneath one of the windows in the Old Session House is the shaft of a free-standing cross, on which is carved the very prominent figure of a bishop in a mitre and carrying a crook. 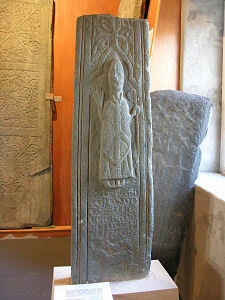 This carries a Latin inscription which translates as: "This is the cross of Thomas MacEachan and of his son Donald." 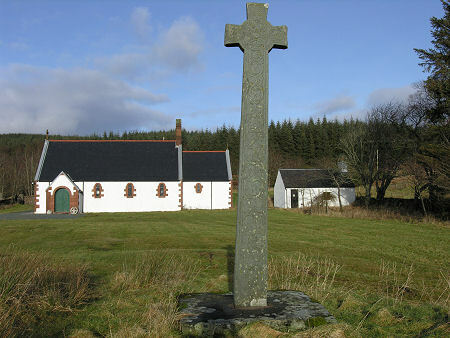 A short distance to the south of the church and the session house, in a commanding position offering the very best views towards Mull, is a tall disc-headed free standing cross. 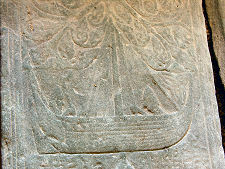 This dates back to the 1300s and all its surfaces carry complex carvings. These include the head of a dragon at the foot of the side facing the church, and two more on the side overlooking the Sound of Mull. Passing through an iron gate takes you into the graveyard. Here the key point of interest lies in the remains of a medieval church. 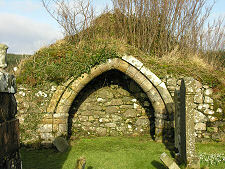 These are extensively overgrown, but a splayed arch on the south side is still very obvious, while on the east side is a trefoil window. Graveyards are often fascinating, and this one is more so than most. A number of very old grave markers are still in use, including another apparently showing just the handle and very top of a sword: which presumably continues underground for some distance. Some of the more recent grave markers are also of considerable interest. 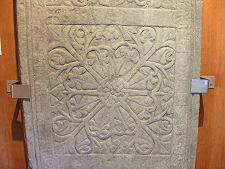 These include several well-carved examples of the typical skull-and-crossbones insignia often found in old Scottish churchyards: signifying not that the inhabitant of the grave was a pirate, but rather serving as a reminder in an illiterate age that death is inevitable for everyone.